Food processing is the fast-growing sector when compared to other industries. Food is the only industry which acts as a bridge from farmers to entrepreneurs. It’s very important that the people in food industry especially the food handlers should know how they may influence in others life through the way they handle food safely. Millions of population are going to consume the food they are producing and processing. Isn’t food safety a much issuing factor? Of course, it is. India’s no 1 CIEH food safety course providers NIST Institute Pvt ltd has certified many safety professionals across India. NIST is present in 9 Indian locations, headquartered in Chennai. 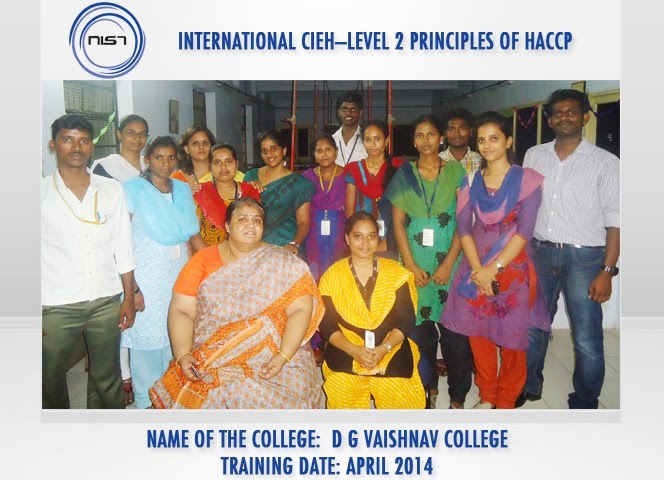 NIST has recently provided International –level 2 Principles of HACCP course in the D G Vaishnav College for Microbiology students on 9th and 10th of April 2014. This certification will help food handlers, food safety assurance andanyone in a catering or manufacturing unit to understand the concepts of HACCP and implement it in their own workplace. NIST is proud of qualifying young safety professionals, as we are majorly contributing to having a healthy nation. At NIST, safety is our passion to make the work place safer. We provide the most indispensable and essential safety training and solutions for the industrial world. With our services started, NIST has emerged as the leader in safety education.